McCloud is a 4-season family destination on the southern slope of majestic Mount Shasta. Year round recreation, stargazing and wildlife viewing abounds in an historic alpine setting. From boating, kayaking, cycling, golf, fly-fishing, hiking, rock climbing, spelunking and whitewater rafting in the summer to snowshoeing, sledding, snowmobiling, downhill ski and snowboarding, and cross-country skiing in the winter, there are miles of trails, lakes, wild and scenic rivers and wilderness to explore around McCloud. Plus, some of the best swimming holes in Northern California! GOLF: Come golf at the area's four nearby golf courses including McCloud Golf Course and Mount Shasta Resort, one of the first golf courses in Northern California. HIKE: Hikers have many options in McCloud and the surrounding region including the Great Shasta Rail Trail, Squaw Valley Creek Trail, McCloud River Falls Trail, and the easy access to the Pacific Crest Trail. Hikemtshasta.com and the Mount Shasta Trail Association are great resources for exploring the trails surrounding McCloud and the Mount Shasta region. The sites include lots of photos and detailed trail descriptions. ROCK CLIMB: Climbers looking for alternate routes up Mount Shasta can access the Clear Creek and Brewer Creek trailheads from the McCloud side of Mount Shasta. FISHING: For fly fishing it doesn't get any better than the McCloud River. 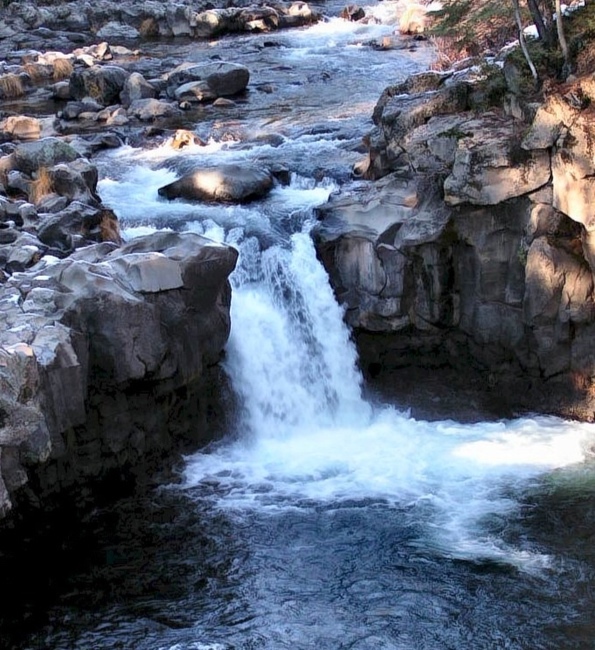 Access the river from the McCloud River Falls or from the spectacular Nature Conservancy. Be sure to contact Jack Trout Fly Fishing for all of your fly fishing and traveling needs! BOATING: McCloud Lake offers motorized boaters access to great trout fishing and water skiing. Boat rentals are available at nearby Lake Siskiyou. RAFTING: Experience white water rafting for all levels on one of our several area rivers including the Klamath, Cal-Salmon, Scott, and Upper Sacramento. River Dancers out of Mt. Shasta, CA can hook you up with everything you need for the water excursion of a lifetime! Visit their website to learn more about the different trips they have to offer. SPELUNKING: Caving around McCloud includes Lava Tubes and spectacular Ice Caves. McCloud Outdoors & Gear Exchange works with local permitted guides to plan a trip geared to your adventure level. WILDLIFE VIEWING: You may choose to explore the views with a drive along beautiful Highway 89 to Mt. Lassen from McCloud, a Gateway along the Scenic Byway. Tour Lava Beds National Monument, Medicine Lake Highlands and Lower Klamath National Wildlife Refuge, all unique and remarkable experiences. Photograph wonderful mill-town architecture in McCloud and countless vistas in the surrounding area and bring home your priceless memories! A Winter Wonderland Awaits You and Bids You Welcome With a Full Range of Winter Activities! Mt. Shasta Ski Park, just 5 miles from McCloud, boasts outstanding skiing and values for all levels of skiers and snow boarders. Reasonable prices, no lines, and challenging runs means you've made the right decision this year. Mt. Shasta Ski Park offers all the amenities you'd expect to find in a thoroughly modern ski facility including challenging runs, night skiing, lessons and helpful staff. Most McCloud accommodations offer money saving ski packages as well. Other snow sports include cross country and nordic skiing, snowshoeing, snowmobiling, sledding, and dog sledding. Snowshoes may be rented from McCloud Outdoors & Gear Exchange. Cross country skiing is enjoyed at McCloud Flats, the Mt. Shasta Nordic Center or Snowman's Hill. Sledding opportunities abound around McCloud for old fashioned family fun. Snowmobiling is enjoyed at several nearby sites, including Pilgrim Creek Snowmobile Park. Mountain climbing the winter routes is enjoyed by many, or perhaps strolling or snowshoeing through a mystical white landscape is more your style. The breathtaking scenery around majestic Mt. Shasta brings people back every year to experience the wonder of our unique area! Please note some of these documents are rather large and may take a few minutes to appear, depending on your connection speed to the Internet. Please be patient. Upper McCloud River Area - The Upper McCloud River area is accessible by a scenic road which forms a loop. Drive 65 miles north from Redding on Interstate-5 to the Highway 89 exit just south of Mt. Shasta. Drive east on Highway 89 past the town of McCloud. The loop road begins 5 miles from McCloud at the Fowlers Campground sign (exit). From Fowlers campground the road winds along the river passing various recreation sites and comes back to Highway 89 approximately 11 miles east of McCloud. The loop road is approximately 6 miles long. Note: the map is embedded in the PDF guide or you can click on the link below. McCloud Area Recreation Guide - This Recreation Opportunity Guide provides a brief overview of recreation facilities and opportunities available in the McCloud area of the Shasta-Trinity National Forest. Whether you are planning to go camping, fishing, hiking, boating, picnicking, snowmobiling, cross country skiing or sight seeing, the choices for recreation are almost unlimited. Medicine Lake Highlands: Self Guided Roadside Geology Tour - One of the most diverse and least visited volcanos in the state of California is Medicine Lake Volcano. It lies east of the main volcanic axis of the Cascades , and is much different than the more typical Cascade Mountains stratovolcanos, such as Mt. Shasta and Mt. Lassen which stand nearby. Because this subrange of the Cascades is somewhat remote, the fascinating nature of this area is largely unappreciated. Medicine Lake Highlands Volcanic Area - The 1981 eruption of Mt. St. Helens in Washington focused national attention on the Cascades as a geologically active volcanic mountain range. It came as a surprise to many that active volcanoes actually exist in the United States. In California alone, geologists know of at least five volcanic centers that have been active in historic times. They include: Mt. Shasta, Mt. Lassen, the Mono Basin-Long Valley area, CIMA volcanic Field, and the Medicine Lake Highlands. **These guides are provided by the USDA Forest Service, Shasta-Trinity National Forest. For more information, visit the Shasta-Trinity National Forest - Shasta McCloud Management Unit's website. Shasta-Trinity National Forest - Shasta McCloud Management Unit. The forests, streams, and meadows surrounding the little town of McCloud offer excellent summer birding in a gorgeous mountain setting. Although McCloud itself is situated at the deceptively low elevation of 3,200 feet, it is conveniently close to alpine recreation areas, and less than 20 minutes by car from I-5 and Mt. Shasta City. Mt. Shasta Chamber of Commerce - Chamber & Visitor Information. Weed Chamber of Commerce - Chamber & Visitor Information. Dunsmuir Chamber of Commerce - Chamber & Visitor Information. Yreka Chamber of Commerce - Chamber & Visitor Information. The town of McCloud is located along the Volcanic Legacy Scenic Byway All American Road. Along this 500 mile journey from volcano to volcano you will find opportunities for adventure, exploration, communion with nature and an appreciation for the culture and history of the region. You will also find residents eager to share the beauty and mystery of this land that is dotted with evidence of an eruptive past. Follow this link for detailed information on the Waterfalls Region of McCloud and Burney Segment of the Volcanic Legacy Byway.